The mallards are the ancestors of all domestic ducks. They have become nicely adjusted to urban life, much thanks to ourselves; probably this is how they were domesticated in ancient times. A part of the mallards are stationary in winter even in Estonia. Those who nest north of us fly towards south to winter, staying where the shore waters are free from ice. The head of the male bird is a metallic dark green, with a narrow white band around the neck. Breast plumage is chestnut brown, the body covered with grey, finely ripple-patterned feathering. Wing coverts and the feathering on the back are blackish brown. The inner feathers, speculum, of the wing are dark blue bordered in black and white. The beak is yellow, the legs orange. The females are similar to other dabbling (non-diving) ducks, only differing with regard to the blue speculum characteristic for mallards. The plumage is mottled in yellow and brown, the underparts paler grey, the beak orange and black-patterned. 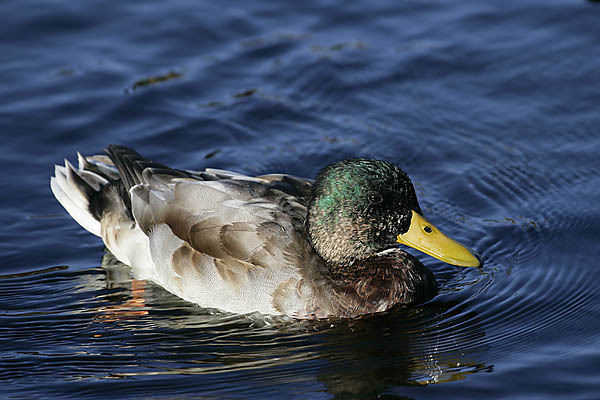 The eyebrow stripe is there, in common with the females of other dabbling duck species. 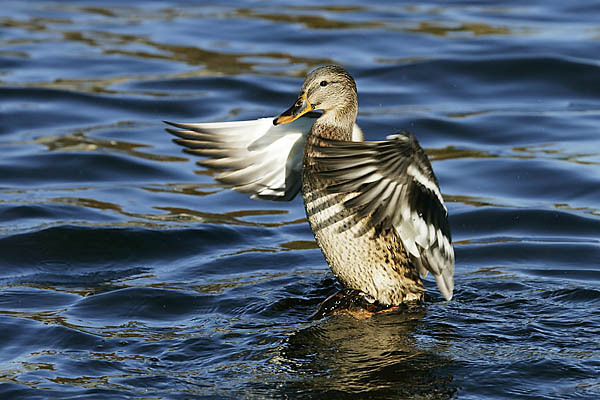 The familiar domestic duck call comes from the females. 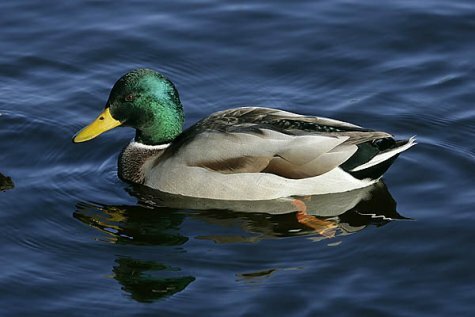 The calls of the male birds are higher-pitched, a more rapid and repeated „quacking“. Nearly all the males have moulted already. In city waters it can be clearly seen. The young from this summer remind of the females in appearance but their breast plumage is darker and more irregularly patterned and the tail feathers are much narrower.